This section is for links to other websites we think may be of interest. American Livestock Breeds Conservancy is a nonprofit organization working to protect over 150 breeds of livestock and poultry from extinction. Founded in 1977, it is working to conserve historic breeds and genetic diversity in livestock. The Barn Journal is dedicated to the appreciation and preservation of traditional farm architecture. Kansas Electric Cooperatives includes 28 local electric co-ops. KEC published Kansas Barns by Bob Marsh. They also publish Country Living bimonthly. It is available by subscription to non-co-op residents of Kansas. In addition to many farm related programs, Farm Bureau honors those who have kept their farms in the same family for over 100 years through their Century Farm program. Go to their website to learn more or visit your county FB office. The mission of this foundation is to preserve, sustain, and grow rural Kansas culture. Become a Kansas Explorer and learn about all there is to see and do in the unique, beautiful rural Kansas countryside and towns. Robert Metzger, Ness City, provides historic architectural restoration of all types. His specialty is window restoration including stained glass. The National Barn Alliance (NBA) encourages the documentation, through surveys and photography, of historic barns and other rural structures. Encourages and supports the creation of statewide and local barn preservation organizations and programs. 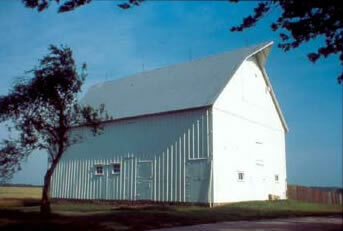 Facilitates the sharing of information on barns, their history and their maintenance. The National Farmers Union believes it is vital to support rural communities across the country. The goal is to help farm owners continue and enhance their current way of life. The independent family farmer is the focus of NFU. Many sources for printed barn repair and preservation information are listed. Len and Linus Schamber operate this family business from their homes in Damar and Hays. They specialize in historic restorations. Please view their past projects on their website. Cleon and Anita Davis operate Spring Creek Guest House on their family ranch. All amenities for up to 10 people are provided in the 4 bedroom, newly refurbished country house. Horse shelter is available as well as many acres for riding and hiking. Hunters are welcome. The Davis farm near Hill City has been in the family since 1881. They currently have a herd of 250 purebred Charolais cows.